Our neighbouring friends have been talking about this place and the activity they enjoyed doing there with their friends and especially kids. This particular activity is not what I fancy nor ever did when I was a kid unlike Darling who is knows well how it works. So off we go one particular weekend to explore and find out if Jonathan boy will enjoy it too. This is located at Bandar Bukit Tinggi II in Klang. It’s a very big field beside the road in a housing area. I just couldn’t believe the crowd and the many kites that are flying high up in the clear blue sky. Most important is that the weather is great…windy! The wind blows away the heat as well. And when I see the size of the field, I was so relieved. So relieved that Jonathan can run around freely and safely while I watch him from a distance and without me having to marathon after him. You sure know what I mean. This is unlike at the playground where I have to carry him up the slide and running after him when he goes near the swing. 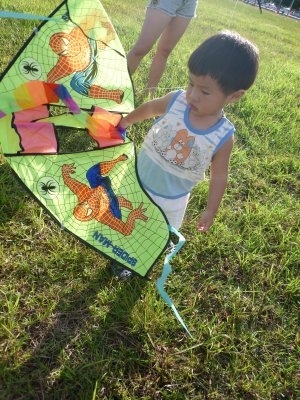 Here’s Jonathan boy, all geared up with his Spiderman kite. This is not all you can do there. We brought along Jonathan’s little bike. The field is a bit uneven so it was kind of hard for him to maneuver his bike. Nevertheless, he enjoyed it. Personally, I love this Batman kite. It looks so real when it is up in the sky. At least Batman does fly, right? They have it in fluorescent orange but it looks quite fake to me. This is definitely a nice place for a weekend activity. You sure agree with me if you see Jonathan when he was all out. The restless him just stopped and sat down on the grass. But that never stop him from enjoying this great outing. We caught him here plucking the weeds. We simply love this place. It’s windy and the field is huge and clean. 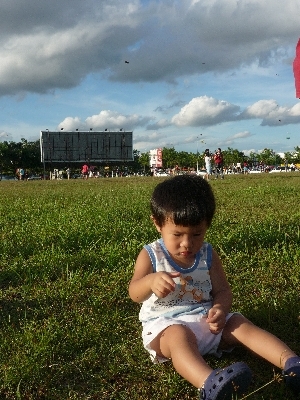 We will surely be back soon ‘coz Darling just bought a dozen of smaller kites and more strings. I hope the kites can fly… 😛 So, anyone keen to join us? This entry was posted on Sunday, July 12th, 2009 at 11:49 pm and is filed under Family News. You can follow any responses to this entry through the RSS 2.0 feed. You can leave a response, or trackback from your own site. 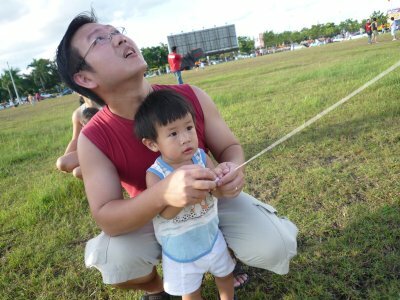 wow…looks like you had great FUN with jonathan flying kites! i dont actually remember when i last play kites! 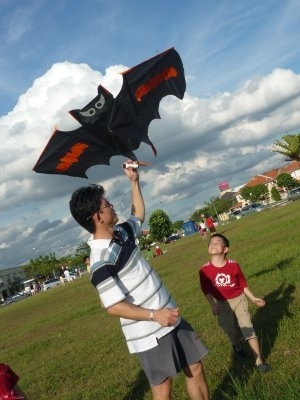 and you’re right, the batman kite sure looks good! hope you will enjoy more activities there in the future! Oh cool….and you got it to fly too! So…you ran with the kite? 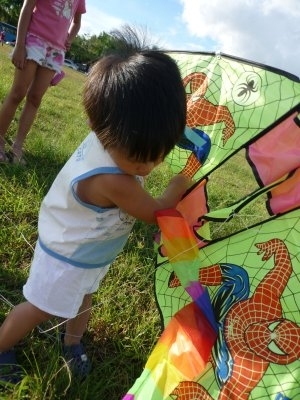 i think kite flying is a trend now..
it is an inexpensive way of spending time… nice..
May explore it this weekend!! nice place to have a family outing! 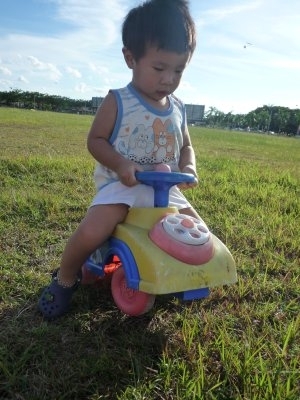 i haven’t taken my Ryan to any play ground / field quite some time already. been at home most of the time.. not so healthy huh? 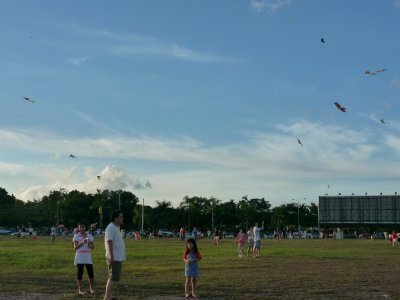 Lovely~~~~ Kite flying session somemore…. i always wanted to try this when i was young too and never got the chance. must bring keira for kite flying too, looks so fun! I wanna join I wanna join..hehe. A dozen of smaller kites? I think I have seen it here. Very cute! I always bring Sarah to the field at Kota Kemuning, opp the McD. Have you been there? didn’t know that Bukit Tinggi got a place like that wor… Long time hasn’t been there liow!! !